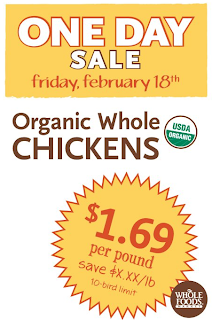 Organic Whole Chickens $1.69/lb. at Whole Foods 2/18! 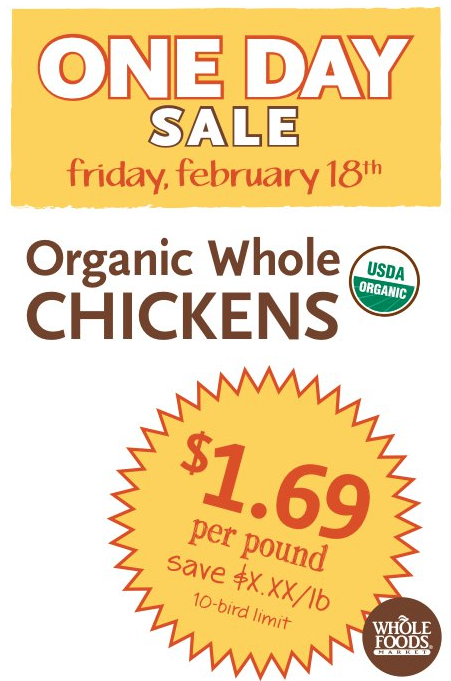 This Friday you can get Organic Whole Chickens for $1.69 per pound!! I found this on Whole Foods Facebook page where they state that the sale will be going on in ALL US Stores! They say there is a limit of 10 per person (wow!) but some stores may have different limits. The sale is this Friday ONLY. The chickens meet the USDA's organic standards. See Whole Food's Blog for a bunch of chicken recipes!